Hello there, I am back today to share another two Clearly Besotted teasers with you. Not long to wait for the new products now, they will all be released tomorrow at 10pm BST. Today I am using another two new sets - Make A Splash & Cute As A Bug. 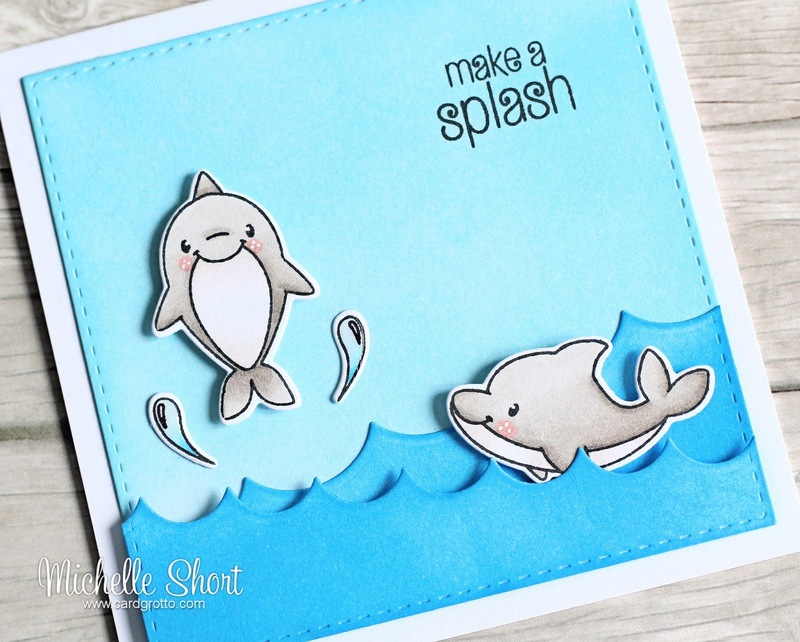 I am starting off with the Make A Splash set. Oh my goodness, these dolphins are adorable! I started off by cutting a panel of white cardstock twice, using the SSS Stitched Squares set. With one of the squares, I took the CB Scallop Edges Die Collection and using the two largest, cut the square to make two waves. These were then coloured with TH Distrtess Ink in Salty Ocean, using a blending tool. The full square piece was coloured using Tumbled Glass. 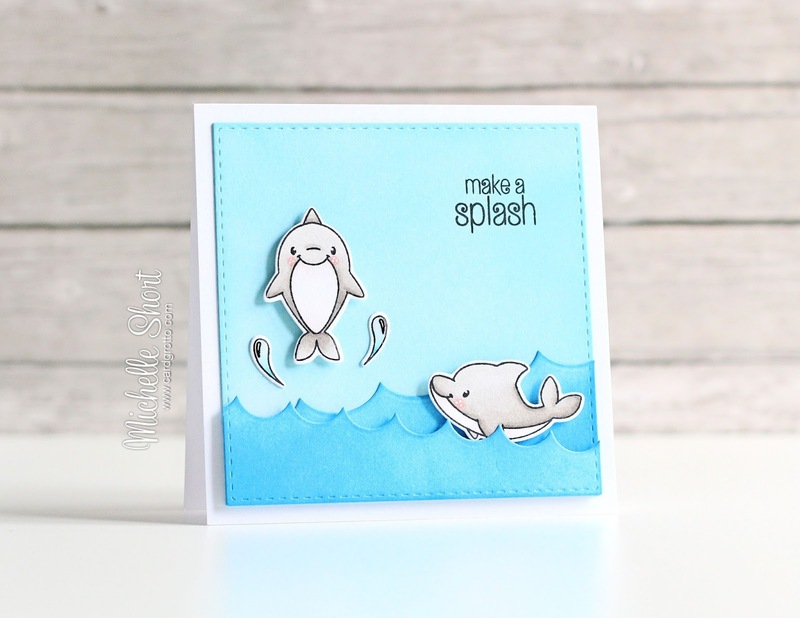 The dolphins and two splashes were stamped on to white cardstock with black ink. These were coloured using Copic Markers; adding Glossy Accents to the splashes. The sentiment, from the same set, was stamped in the top right corner of the panel. I layered up the waves on to the piece, the top one being added with foam tape. The dolphins were popped on to the scene, also with foam tape. The whole panel was then adhered to a white 4x4" card base with foam sheet. COPIC MARKERS: Dolphins: W5, W3, W2, W1, W00, R20, R000. Splashes: B04, B01, B00. My next card uses the Cute As A Bug set. Oh my goodness, this is another real cutie! It is filled with super cute bugs and punny sentiments. I started off by cutting a square using the SSS Stitched Square dies. The bee image was stamped on this using black ink. He was masked off and then the flower was stamped on top. The stem to the flower is actually a branch but turned on it's side it looked like a stem, so I added that below. 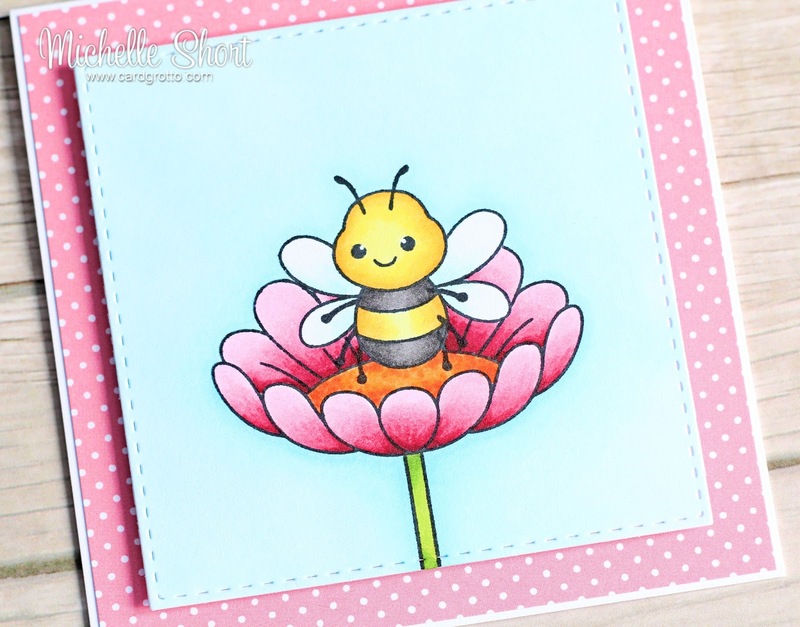 The image was coloured with Copic Markers, adding a little clear Wink of Stella to the bee's wings. This panel was adhered, with foam sheet, to a card base which has a sheet of paper from the Lawn Fawn Let's Polka Mon Amie on. I left the sentiment off until I knew what occasion I would send it for. I think it would work for many occasions. COPIC MARKERS: Flower: R89, R85, R83, R81. YR18, YR16. Stem: YG17, YG23. Bee: Y19, Y17, Y15, Y13, Y11. T9, T8, T6, T5. BG11, BG10. Sky: B0000, B000, B00. I hope you are enjoying the teasers so far? As always, please pop over and see Stephanie for her amazing cards as well as links to the other DT and GDT sharing today. I hope you will join me tomorrow for my last teaser. Have a great day and thank you for visiting me today. Awww, these are completely adorable Michelle! I have to tie up the pursestrings this month, but I may have to have those dolphins, & put the bugs on my wish list! Oh my cuteness!! These are so adorable, I love them both! As always, love your colouring, well done! :). Dotty. 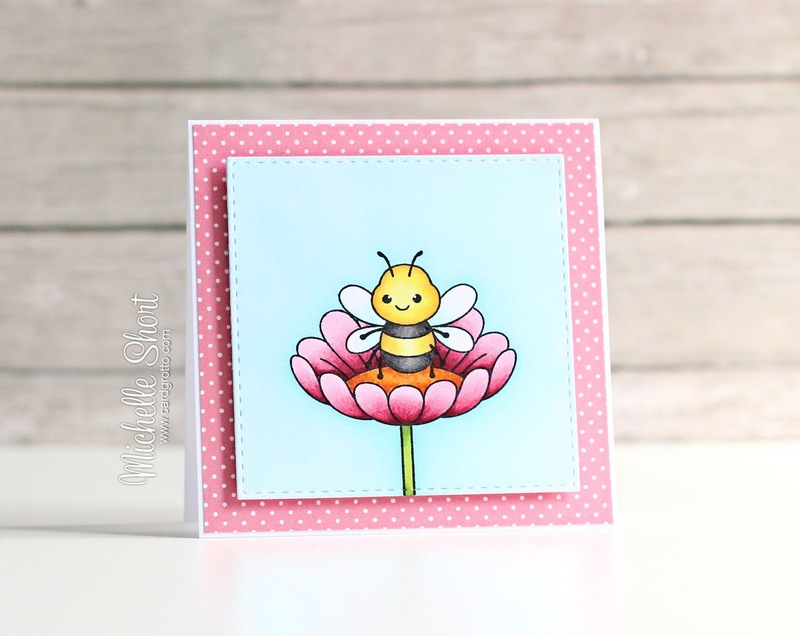 very nice cards I love the bee and the flower this is My favorite. this is so sweet , My favorite is the bee and the flower. Adorable cards, Michelle! I love how you have the dolphin jumping out of the waves. I've not long discovered your blog and love absolutely everything you do. Thank you Michelle for inspiring me. Oh my goodness, Michelle, you are soooo creative and talented. LOVE LOVE LOVE these cards!!! 2 fabulous card,Michelle!! I really adore your coloring...SO beautiful!!! Super cute cards Michelle. These new sets are just too much fun. These are just too darn cute!!! Oh my gosh.. That bee is so stinkin' cute!